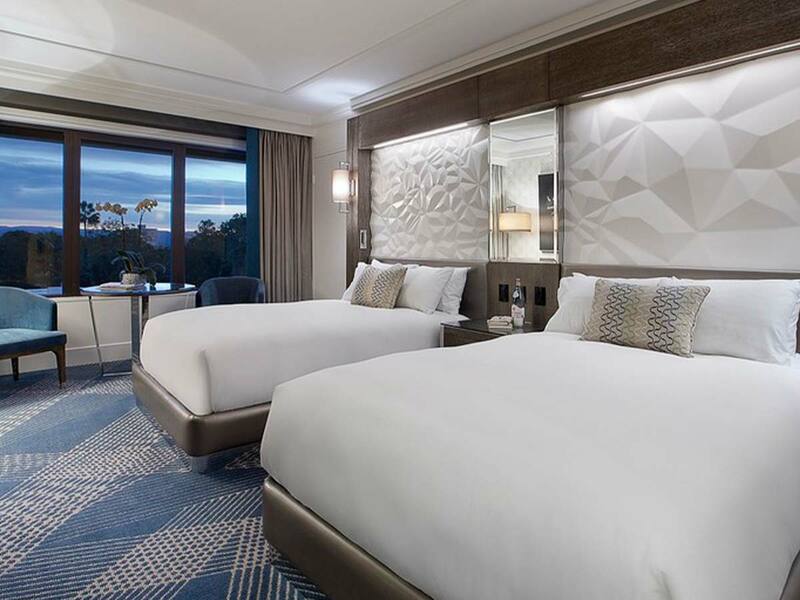 Boasting tasteful design and contemporary features, your Superior Deluxe Room will have you feeling right at home on the Gold Coast. Equipped with the latest state-of-the-art technology, you won’t be lacking in creature comforts this holiday. We’ll get you to and from your holiday with no troubles – all you need to do is pack your bag and make your way to the airport! Enjoy return economy flights including 7kg carry-on baggage inclusive with the price! Need more baggage space? Just ask our Holiday Experts how! Start your mornings the right way, with a stomach full of sumptuous breakfast foods! The talented chef’s at Harvest Buffet put on a fantastic array of choices, so fill up a plate, pour yourself a cup, and fuel up for the day ahead. Drive up the palm-lined driveway and be treated like a star! You’ll feel like a VIP with exclusive valet parking, plus you’ll know that your car’s in good hands! Perfect for a night in or a rainy day, watch a movie or two and enjoy some time out. There’s a great range to choose from, so you’re bound to find the perfect flick! Who doesn’t love getting something extra!?! Enjoy this complimentary welcome gift bag on your arrival to get you in the holiday spirit! Get pampered with us! 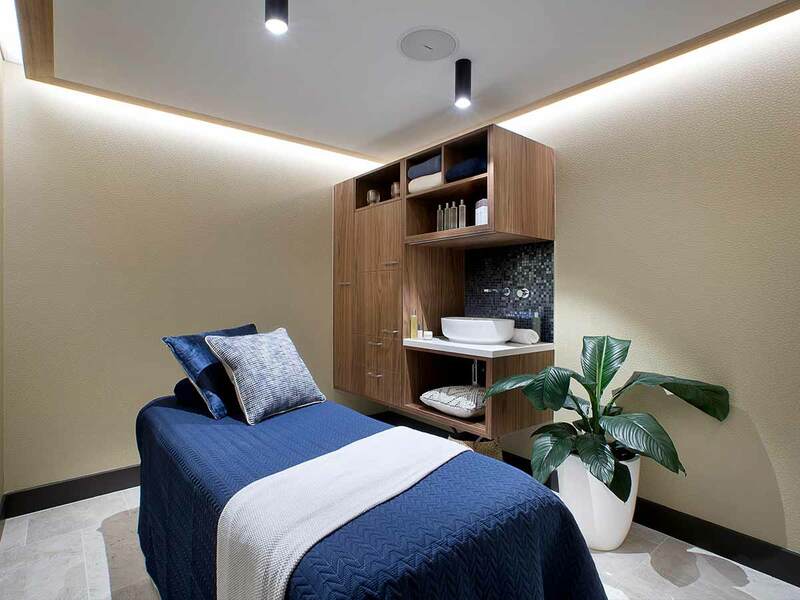 Rejuvenate your mind, body and soul when you visit The Star Grand Gold Coast this holiday. Enjoy 4 x $25 off vouchers for spa treatments at Azure Spa & Fitness. Test your luck with a lot less risk! Play, banter and soak up the energy of the world-class Star Casino. With Dollars on us, you’ll be able to relax and completely enjoy yourself! We all get a little peckish after a long flight, and there’s nothing that says ‘holiday’ like a cheese platter and bottle of sparkling wine when you arrive at Star Grand Gold Coast! Sip and snack away after your check-in! Feast and save with 15% off dining voucher that can be used across the resort! Get more out of your Gold Coast holiday and save each time you dine! Travelling with kids doesn’t have to be expensive. With this exclusive bonus, 2 children can stay for free at Star Grand Gold Coast. 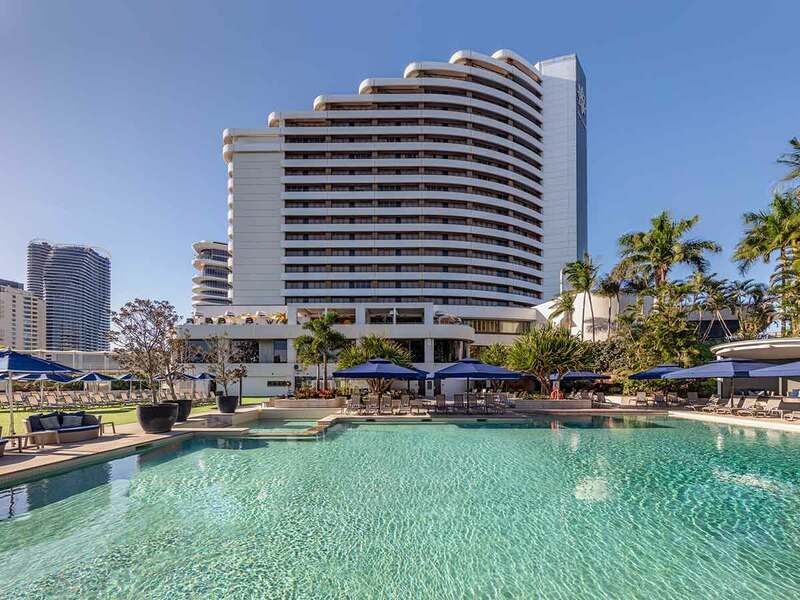 Discover ultimate Gold Coast luxury at The Star Gold Coast. 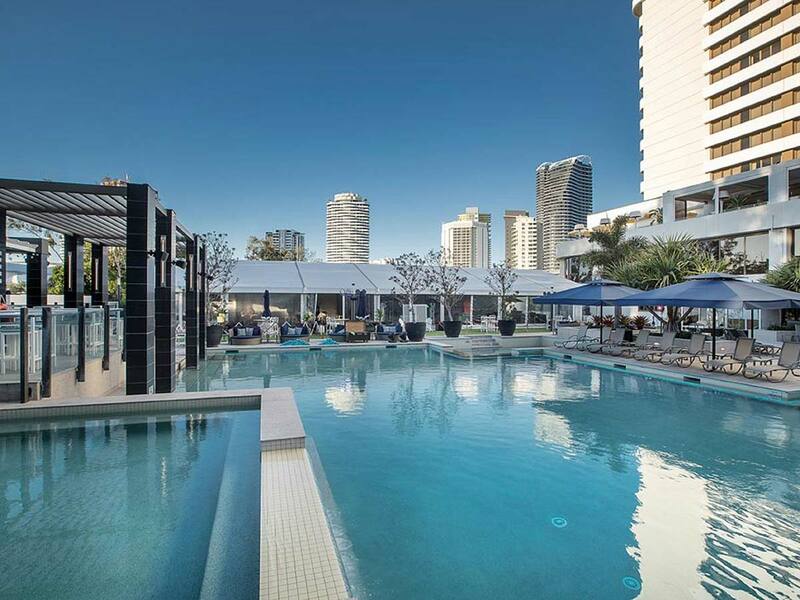 Fresh off an exquisite renovation, this incredible hotel is set in a prime position on Broadbeach Island. 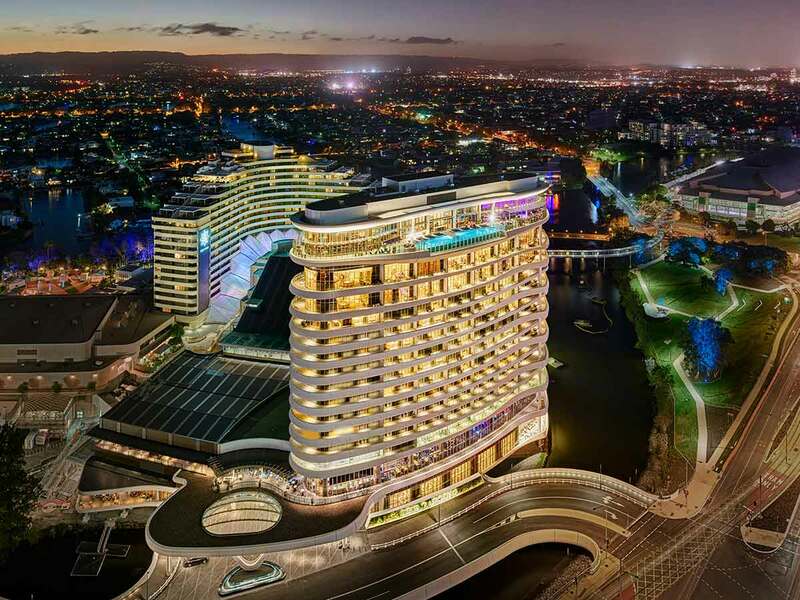 It is attached to the 24-hour Star Gold Coast Casino (previously Jupiters Gold Coast) and surrounded by lush landscaped gardens on the banks of the canal. Approach valet parking along a palm-lined driveway and be treated to exceptional service and sophistication from the moment you arrive! 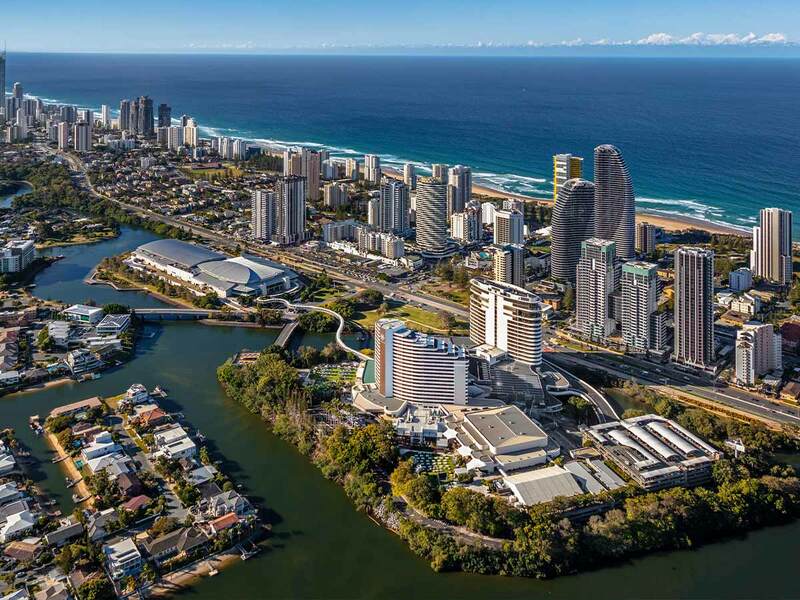 Take in sweeping coastal and hinterland views, enjoy easy access to Pacific Fare Shopping Centre and the Oasis Shopping Centre (both within a 10-minute walk), plus stroll to the beautiful Kurrawa Beach and Park at Broadbeach, just 1km away! 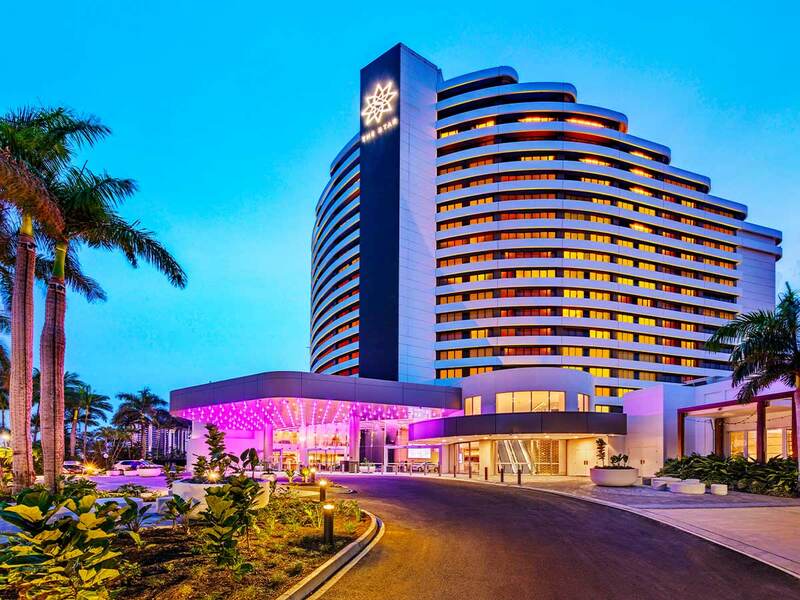 There are 596 lavish rooms at The Star Gold Coast. Each has been designed to ensure your stay leaves you feeling refreshed and recharged and luxurious touches wait at every turn! Control your space with the integrated control system and have the blackout curtains open up to expose stunning Gold Coast scenery. Make yourself at home with the push of a button, tailor state-of-the-art-technology offerings to suit your climate, lighting and technology needs and settle in with a quality coffee from the complimentary machine. Rest easy during your stay and soak away your stress. The hotel’s rooms boast a signature range of plush bedding and pillows, rainfall showers and prestige L’Occitane amenities. The Star Gold Coast’s luxe experience extends well beyond the rooms and suites. Explore the hotel’s 21 floors to discover a range of incredible facilities. Witness live music and entertainment at the casino, dine at 7 specialty venues (including the most popular buffet on the Gold Coast! ), sweat it out with a range of classes, cardio, free weights or personal training at the fitness centre, relax in the steam room, or head out to the expansive outdoor pool to sunbake in a cabana or private bungalow. The Star Gold Coast has 5 premium bars, including the outdoor pool bar and function space and a designer-branded gift shop. There’s so much to do here, you won’t want to leave! ***1 x welcome gift bag provided on arrival including – Vogue Diffuser – Vanilla Bean fragrance, Bottle of Beautiful Somewhere Shiraz, Jocelyn’s Chocolate. ^^1 x $50 casino dollar voucher – Casino Dollars – The Casino Dollars voucher will be issued to you on check-in. To redeem the Casino Dollars voucher, you must be 18 years or over and a member of The Star Club. To join The Star Club, visit The Star Club Desk and provide photographic identification. Casino Dollars voucher must be presented and surrendered at The Star Club Desk to redeem the offer.  Casino Dollars can be redeemed at The Star Gold Coast’s food and beverage outlets, towards your hotel stay, for play on compatible electronic gaming machines or for play on table games. For further information on earning and redeeming Casino Dollars, visit www.thestargoldcoast.com.au or The Star Club Desk on the Main Gaming Floor. Casino Dollars may become unavailable due to technical difficulties out of The Star Gold Coast’s control. No remaining credit will be refunded. Bet with your head, not over it. ^2 x $25 off Azure Spa Treatment Vouchers per person – vouchers cannot be combined. #Twin booking can be requested at time of booking, but can not be guaranteed. ##Children stay FREE when sharing with adult utilising existing bedding – maximum 2 children under 12 years. *Additional nights are bed and breakfast only.